Get a bit of Rio de Janeiro with the VXRSI Rio T-Shirt! Made from 100% cold combed cotton, the VXRSI Rio T-Shirt is sure to be an eye-turner. Inspired by the city of Rio de Janeiro, with the Brazilian flag in front and the all-so-famous Christ Statue at the back, with the words “Vale Tudo” and “Luta Livre” on the sleeves, this shirt gives off a very Brazilian vibe, and that’s a bit of an understatement. 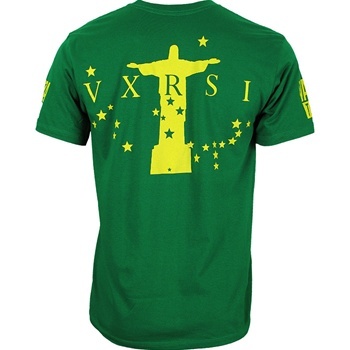 The VXRSI Rio T-Shirt is available at MMAWarehouse for a mere $27.99 so what are you waiting for? Get your bit of Brasiliano now!